Atoms combine to form molecules, molecules combine to form single-celled organisms. When people come together, they build societies. Our world is nested, both physically and socially, and at each level we find innovations that were necessary for the next level. Physics has gone far in mapping the basic mechanics of the simplest things and dynamics of the overall nesting, as have biology and the social sciences for their fields. But what if anything can we say about this beautifully complex whole? Might there be general processes we can identify? How do phases shape others, and what more can we learn about human existence through understanding an enlarged field of creation and being? 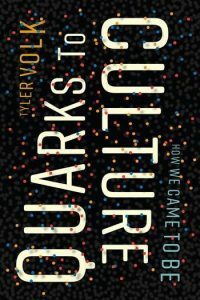 Quarks to Culture explores the rhythm within what Tyler Volk calls the “grand sequence,” a series of levels of sizes and innovations building from elementary quanta to globalized human civilization. The key is “combogenesis,” the building-up from combination and integration to produce new things with innovative relations. Themes unfold in how physics and chemistry led to biological evolution, and biological evolution to cultural evolution. Volk develops an inclusive natural philosophy that brings clarity to our place in the world, a roadmap for our minds. As combogenesis repeats, patterns enrich like an expanding musical progression. Quarks to Culture provides new insights into linkages in our sciences and presents an exciting synthesis of ideas across a sequence of things and relations, from physical to living to cultural. It is high adventure for readers who seek to understand big history and wrestle with questions of how we came to be.